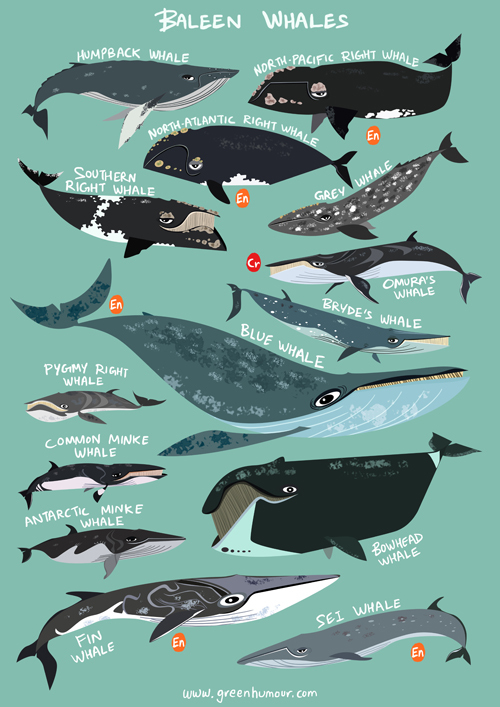 This World Oceans Day, know your Baleen Whale species with this poster! The 14 species are distributed throughout the marine waters of the world. Baleen whales are called so because of the presence of baleen plates in their mouths instead of teeth, that enable filter feeding. The largest baleen whale is the Blue Whale, while the smallest, the Pygmy Right Whale. Most baleen whales are threatened by whaling, collisions with ships, entanglement in fishing gear, and climate change; the Omura's and the North Pacific Right Whale being the most endangered. The compilation is available as prints and a wide range of merchandise (t-shirts, laptop skins, tote bags etc) on my webstore here.